Once upon a time, in a land far away, there lived four characters who craved fame. You see, they used to be the talk of the kingdom – boys and girls around the entire world loved them, and their names were recognizable wherever one would go. Things change, new stories get told, and beloved old storytime characters get lost in the shuffle. You ever stop to think that maybe those characters don’t want to fade away? That maybe they’ll do anything to get back in the limelight of their former glory? In Playlogic and Game Factory’s Fairytale Fights, this is exactly the case – and things get bloody. Very bloody. During E3 I got to see this title in action during one of Playlogic’s closed-door presentations, and it far surpassed any expectations I had for it. Before firing up the game, we were told that the company places the game in the “hack-n-slash platform adventure” genre, and believe me when I tell you that “hack-n-slash” is being quite literal. Firing up the game on PS3 to demo it to the small audience, we were first treated to the “hub” area. 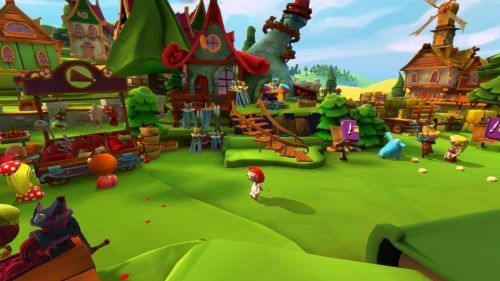 Akin to all of Rare’s platformers, all the stages are accessible via one common area; this area is also host to the game’s shop as well as the entrance into the multiplayer arena. 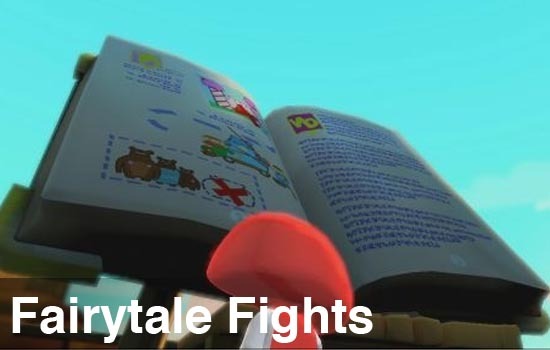 Taking a first glance at the game in action, you can tell that the Playlogic team has worked pretty hard to make Fairytale Fights a visually stunning experience. Looking closely at the backgrounds and the buildings surrounding Little Red Riding Hood, we saw that everything was made out of books, or at the very least book-themed. One of the levels featured took place in a wooded area, and leaves would be falling from the trees – inspecting further, you’d actually see that the “leaves” were just green colored pages. The book theme combined with the bright palette of colors used creates a very whimsical atmosphere – one you would come to expect being that the game takes place in a land of fairy tales. The game was made using the Unreal 3 engine, so everything looks fantastic and crisp… and then there’s the blood. In stark contrast to the rest of the visuals that set the atmosphere of Fairytale Fights, I can honestly say that this is one of the bloodiest games I’ve ever seen. Using any bladed weapon, your character can chop enemies any which way he or she wants – your left analog stick controls movement, but the right one works your character’s weapon arm; whichever way you swing the analog stick, that’s which way your character will swing the weapon. This system (dubbed “Salami Violence” by the developers) was super impressive. Pushing things over the top, all your slice and dice action is actually presented in a picture-in-picture window that pops up on screen. Using certain weapons you can chop or slice the enemies multiple times with a super-powered “Glory Attack”, after which the bloody, still-moving pieces fall to the ground. The dev team even made sure to add in the gruesome detail of being able to see the enemies’ skeletons and internal organs when watching the close-up slice action. The Playlogic rep giving the presentation let us know that the game was meant to be presented very much from a “over-the-top violence is funny” kind of angle, and said that a couple of the designer’s influences included the Happy Tree Friends, and Itchy & Scratchy from The Simpsons. It definitely shows. Page created in 0.4515 seconds.